Erica was out of town, and Todd Stuart told me he was climbing with Karl Baba, so I whined and begged and finally Todd said I could come along. We drove to Karl's house, arriving late Friday night. I slept very poorly (in fact, not at all) in Karl's trailer, due to snoring issues and other problems. 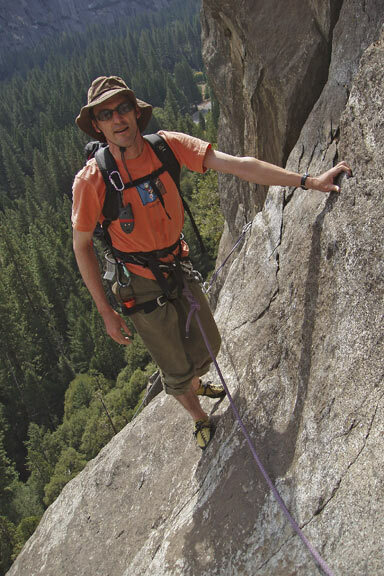 So the next day I was dizzy and bleary-eyed - not ideal for climbing, but the feel of rough Yosemite granite perked me up somewhat. 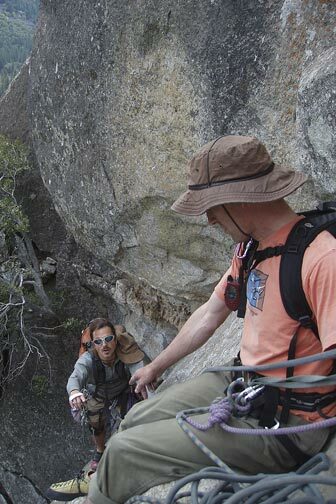 Me belaying Todd. Lost Arrow Spire in background. First we did Commitment, which I had done with Dave Altman 2 years earlier. Three pitches. The very first move is 5.9 (though I cheated using a tree) and the last pitch has a tricky traverse-the-overhang move, but the rest is 5.6 or so, mostly hand-crack. We continued up Selaginella. The first pitch, Karl warned, involved some suffering. And he was right! 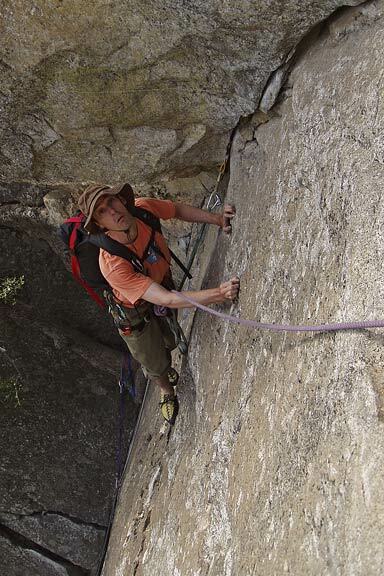 There were a couple of 20-foot stretches of 5.8 hand-crack, with no options for cheating. 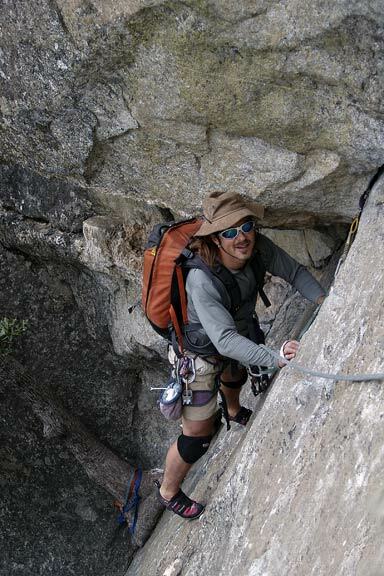 I struggled to stay on, jamming my feet rather painfully, working real hard, developing major Elvis leg, eventually resorting to desperation moves like jamming hips and knees against the wall on either side, mangling my sunglasses which I had put in my pocket and flaying skin from various exposed areas. I was also totally out of breath, gasping for air and sweating like a pig. But I stuck with it and finished the pitch. The next two pitches were easier (and lots of fun). Rain clouds were moving in and it was getting late so there was a little anxiety. But there was just a smattering of rain. 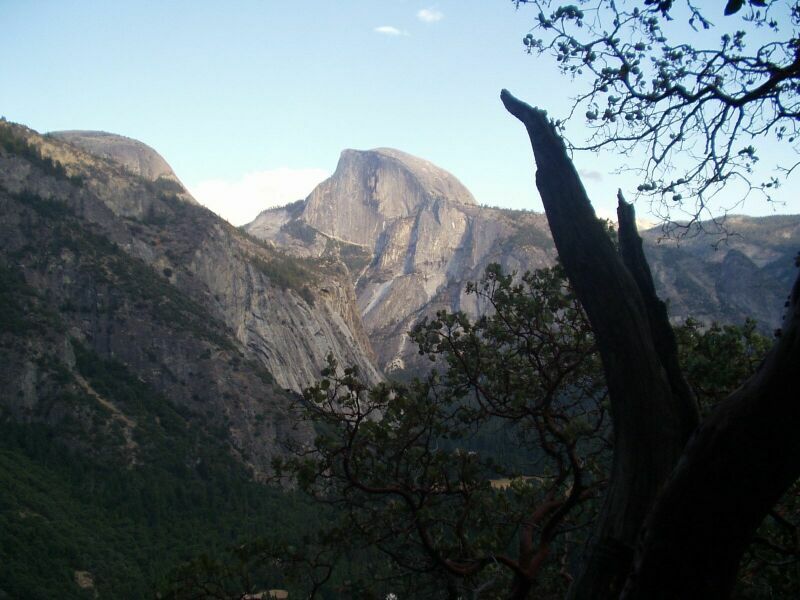 Karl said the last pitch was steep and unrelenting, so I was apprehensive. 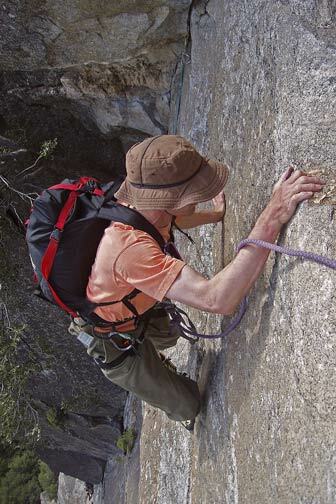 It started out with an 'airy traverse', six feet across a rather large dropoff, which I didn't find all that easy. After that it was straightforward, though I took a wrong turn and had to radio Karl for directions. In the last 15 feet I took an alternative face route on some sharp flakes. I had a little trouble topping out because of dirt. 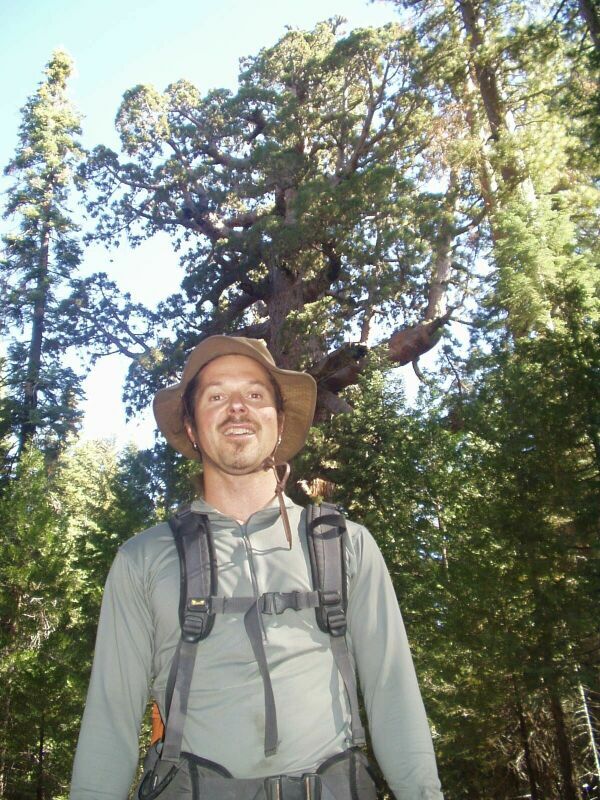 We scrambled up a few hundred feet and met the Upper Yosemite Falls trail, and took it down. A tremendously fun climb! 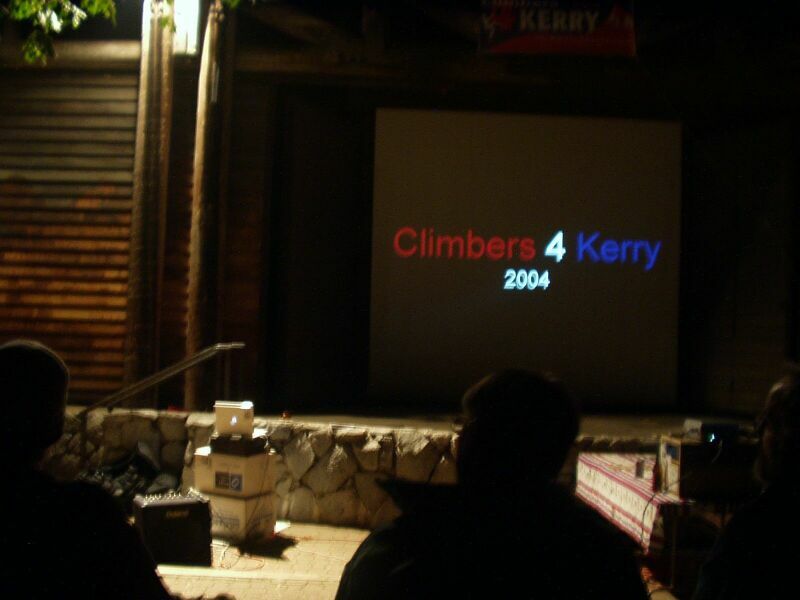 We had heard about a slide show to benefit Climbers for Kerry that night, and of course we went. A couple of hundred climber types were milling around one of the campground amphitheaters. There was free beer. I ran into Hamid and his friend Adam, who had called off their Mt. 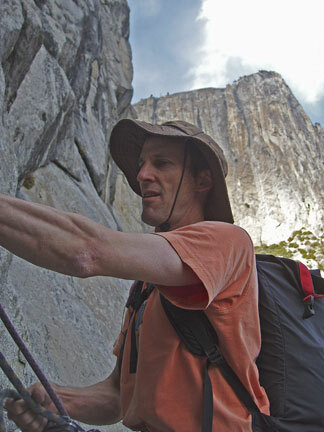 Russell trip because of weather, and had climbed El Cap east buttress instead. 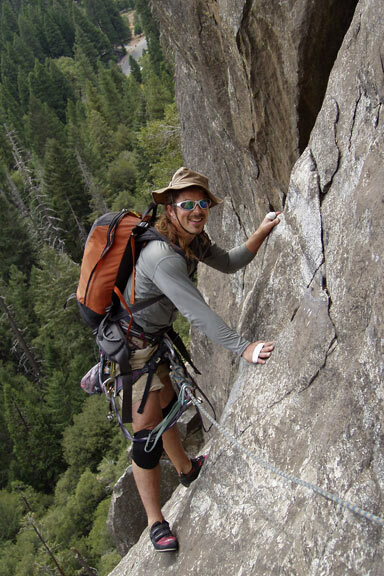 The first speaker was Dean Fidelman, a climber and photographer. He talked about his goals and values in a very simple, direct way (why can't more people do that?). He showed pictures of the Stone Masters (a 'climbing tribe' mostly at Josh), then some photos from the Stone Nudes series. Next up was Timmy O'Leary. 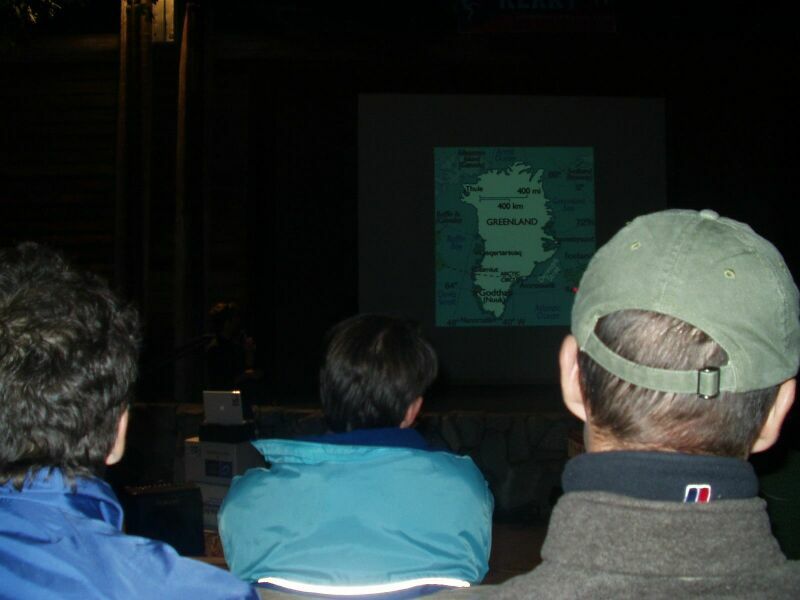 He showed photos and talked about two climbs he had done: an ascent of El Cap with a handicapped climber, and a big-wall expedition to Greenland. 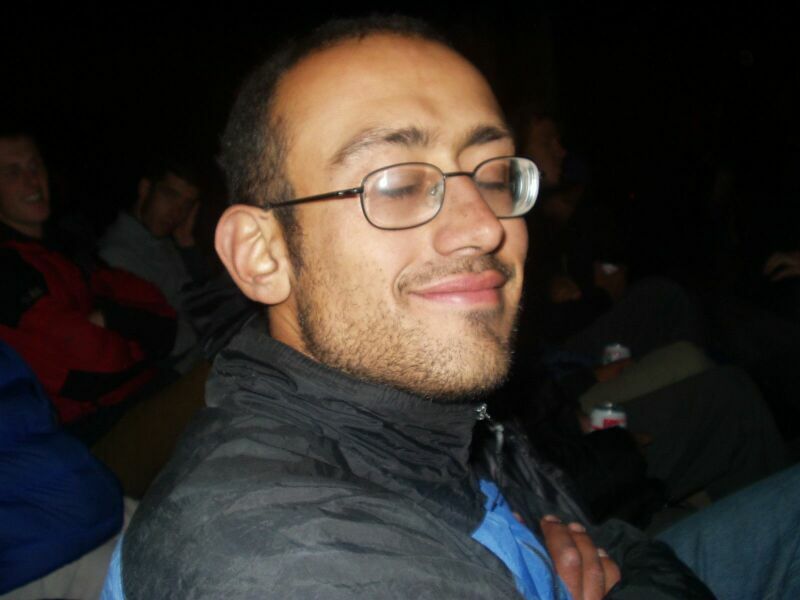 He also showed a Flash animation called 'A Brief Biased History of Climbing', which dissed Hans Florine. But the stories and pictures were a minor sidelight: Timmy O'Leary is a world-class standup comedian, and he kept the audience in stitches for about two hours. He riffed on anything and everything. He put up a map of Greenland and made fun of the names of the cities, which may not sound funny, but it was! For every noise or movement from the audience there was an instant wisecrack response. Some of his humor was lowbrow - like saying that his male member was so big that, although not a state, it did have its own zipcode - but after every filthy or sexist joke he chirped 'My bad!' as if that absolved pretty much anything. He was also pretty good at microphone noises, e.g. a schtick where the state of Texas was strafed and nuked for about 5 solid minutes, and bits where people flat-lined for various periods. Anyway, he certainly relished the limelight, and kept going for around 2 hours, which tested the endurance of the audience. Fortunately I had some cold-weather gear on. 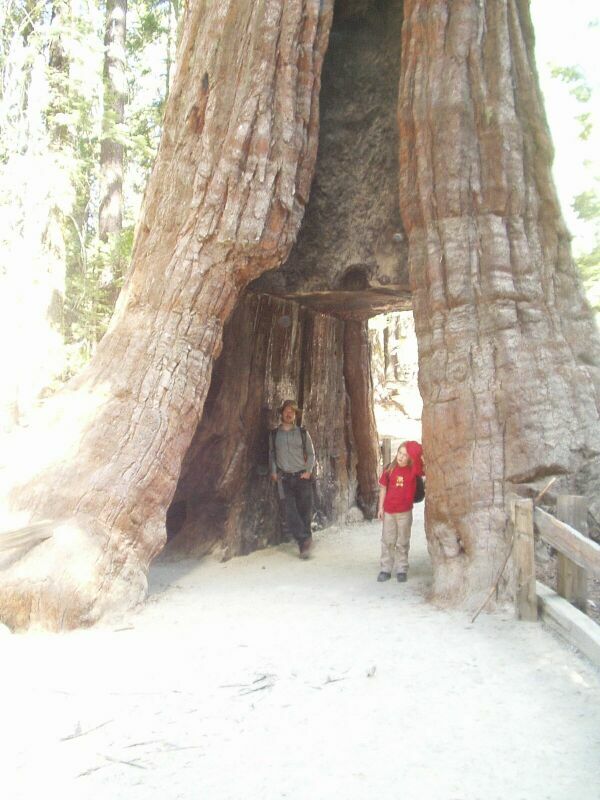 Next day Todd and I stopped by the Mariposa Grove on our way home.